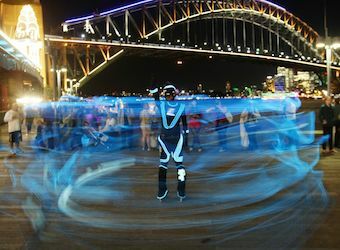 In partnership with Intel Australia, this year’s Vivid Sydney festival is set to feature a giant robot and host of interactive displays. Intel will power many of the festival’s installations including a display of colourful boats covered in LED lights and a giant robot controlled by an Intel tablet. Visitors will be given the opportunity to control the colours and movements of the robot and will be encouraged to upload photos of it to Instagram to be in the running for a free Intel tablet. Last year’s interactive feature allowing visitors to ‘paint’ the Sydney Harbour Bridge using a touch screen is also back. Managing director of Intel Australia and New Zealand, Kate Burleigh, said the partnership meant the company was involved not only in grander installations but the wiring behind them too. “Whether it’s digitally ‘painting’ the iconic Sydney Harbour Bridge using a custom built Intel tablet, or our tiniest processors helping control the beautiful Harbour Lights installation, our technology is working to make it happen,” she said in a statement.